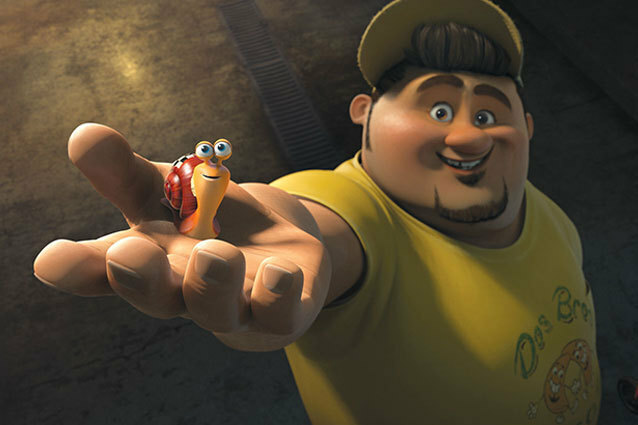 There’s already been animated features about bugs and rats, so why not snails? It can’t be that hard to turn these slimy mollusks into adorable and funny characters on the big-screen. 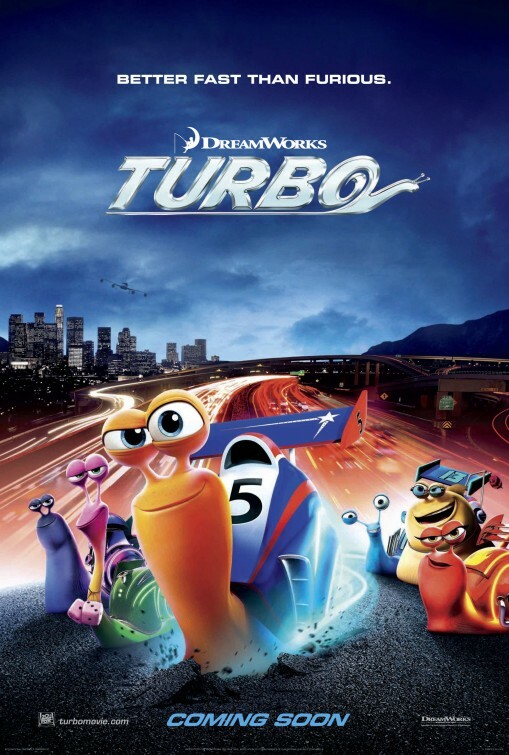 So, here comes “Turbo”, the ironically titled movie from Dreamworks (a studio on a roll since the success of “The Croods”, released a mere four months ago), a summer movie that hopes to rescue you (while dipping into your wallet) from the long hot days of summer. Instead of moving as slow as, well, a snail, here’s a colorful movie providing entertaining refuge in a cool multiplex and not much more beyond that. It’s a family film that offers such visual variety as juicy red tomatoes and the neon blue glow which puts its bored snail on a fast track to his dreams. Deep inside the lawn of a San Fernando Valley home, resides a community of garden snails whose sole purpose in life is to sift out the best tomatoes from mealy ones and eat them. That’s it, but Theo (voiced by Ryan Reynolds) wants more out of life. He can’t take anymore of his systematic existence, where the only excitement can get you killed – like when a crow swoops down from the sky to pluck you up, or when a lawn mower gets a little too close, or worse yet, the brutal boy who has an affinity for smushing snails. Theo spends his time in a nearby garage watching racing cars on the television. He’s obsessed with speed, specifically Franch-Cancadian champion driver, Guy Gagne (a hilarious, yet somewhat indecipherable Bill Hader) and often loses himself in his own imagination, visualizing himself zooming at unbelievable speeds, while in reality only eeking by an inch or two in about twenty minutes. His careful older brother, Chet (Paul Giamatti, working the sarcasm/anxiety angle) is the opposite and can’t understand Theo’s preoccupation with going fast and has grown tired of bailing his brother out of numerous situations again and again. One night, after a dangerous mishap, Theo slinks away from the tomato patch and is transfixed by the lines of cars zipping below him on the California freeway. Next thing he knows, he tumbles into a supercharger of a drag racer and is showered with nitrous oxide that bestows him inside and out with the super-speed he’s desired all his life. Still reeling from his transformation and coming to terms with his powers, which has worrisome Chet on edge, he’s discovered by a human named Tito (Michael Pena), who runs a struggling taco stand in a nearby strip mall with his brother Angelo (Luis Guzman), called Dos Bros. Tacos. Tito captures/recruits Theo and Chet (incidentally) after noticing how lightning-quick Theo is and places him in a snail racing competition that he and his local entrepreneurs (Michelle Rodriguez playing a mechanic, Richard Jenkins a hobby shopkeeper and Ken Jeong as an old Asian lady running a nail salon) have created. This is where Theo meets other racing snails, such as Smoove Move (Snoop Dog), White Shadow (veteran voice actor, Michael Bell), Burn (Maya Rudolph), Skidmark (Ben Schwartz), led by the charismatic Whiplash (Samuel L. Jackson, owning his role like no other). Changing his name to Turbo, Theo feels accepted by a group of snails who appreciate him for being able to do what he’s always dreamed, while Chet is sidelined with concern. Life changes even more for Theo when the ambitious Tito gets the idea to enter him into the Indianapolis 500. With his fellow store owners going in with him as managers, the whole gang makes a cross-country trip to the infamous destination. After a media frenzy and some persuading Tito manages to qualify his special snail alongside all the powerful vehicles that dwarf Theo. As his dreams finally become reality, the pressure to succeed mounts, causing the other snails around Theo to rally around him in support. 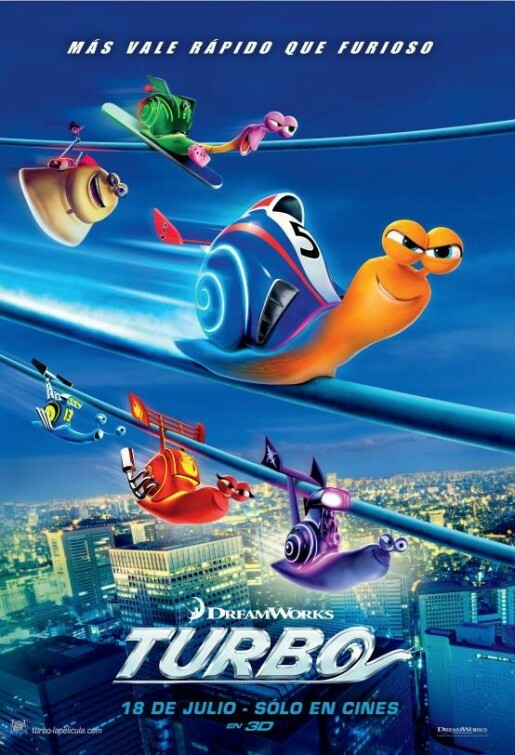 Not to spoil the movie for you, but the snail wins the race in the end in a dramatic way. You knew that was coming though. What else could you possibly expect in such a movie? In fact, the surprises in “Turbo” definitely won’t be found in the screenplay, but rather in the amazing visuals and fantastic sound design. Sure, with so many animated features coming out each year, the majority of them tend to look pretty amazing. We’ve come to expect that by now. Many of them even utilize 3D in some absorbingly inventive ways as well, like we see here. But “Turbo” benefits from having cinematographer Wally Pfister (Christopher Nolan’s go-to camera guy) as an artistic consultant, who is likely responsible for the movie’s captivating action sequences that provide both thrills and laughs. It reminds me how Roger Deakins did the same thing with “WALL-E”, elevating that film to higher level of quality. Although “Turbo” is an overall pleasurable feature, writer/director David Soren does hit a few beats here that snag the flow of the film. That comes once Theo is injected with his toxic blue goo and the movie spins us into some cheap comic turns. I can buy Theo gaining super-speed powers, but I began questioning why his body would uncontrollably blast radio tunes, beep as he backed up and shoot headlights out of his eyes. That all felt a bit much, something forcefully included just for the kiddos. I clearly get that trying to look for logic in a movie like this is fruitless, but it nevertheless took me out of the movie, so I have to mention it. I did appreciate some of the parallel themes Soren provides for the brothers that we follow. We see both Theo and Chet and Tito and Angelo fight over the rash decisions made by each younger sibling. This relatable bit of brotherly conflict and bonding is a nice deliberate move, getting viewers more emotionally involved than they probably would’ve anticipated. It’s during those many emotional interactions that we find both Pena and Giamatti stealing just about every scene. Reynolds delivers the funny with some fine comic timing, but Giamatti really gives Chet a surprising combo of panic and pathos. On that note, I found Pena’s work here quite expressive and warm. Granted much of that comes from the designers and animators, but the Pena adds a delightful humanity to the character, thankfully making him less stereotypical and cartoony. Another hilarious aspect about script worth mentioning is how Soren depicts Theo’s rise to stardom. That it kicks off with a viral footage of Turbo that turns to Sweet Brown heights – with a catchy song to boot – is certainly a laugh-out-loud moment for myself and the entire audience I was with. It makes up for another gnawing aspect of the script, the fact that these snails aren’t able to talk to humans, which kind of limits a clear line of communication between the two species. That kind of thing was handled better in Pixar’s “Ratatouille”. The climax of “Turbo” suffers a bit in length and villainous hysterics from Hader, but by then there’s been enough pleasurable moments that easily make up for any annoyances. “Turbo” has a silly and friendly weirdness about it, making it easy to get revved up over an animated feature that offers a fun diversion from the hot summer sun.